Panjim, Sept 27: Goa achieves yet another milestone at the National Tourism Awards held in the national capital today bagging the prestigious national tourism award in the category of Comprehensive Development of Tourism (Rest of India) for the year 2016-17. The award was presented by the Hon’ble Union Minister for Tourism, Mr. Alphons Kannanthanam and was received by the Hon’ble Minister for Tourism, Govt. of Goa, Mr. Manohar Ajgaonkar along with Managing Director of GTDC, Mr. Nikhil Desai in the distinguished presence of Secretary Tourism, Govt. of India, Ms Rashmi Verma (IAS). This is the second year in a row that Goa has bagged a prestigious National Tourism Award. This is also the second time Goa is bagging an NTA in the category of Comprehensive Development of Tourism (Rest of India). 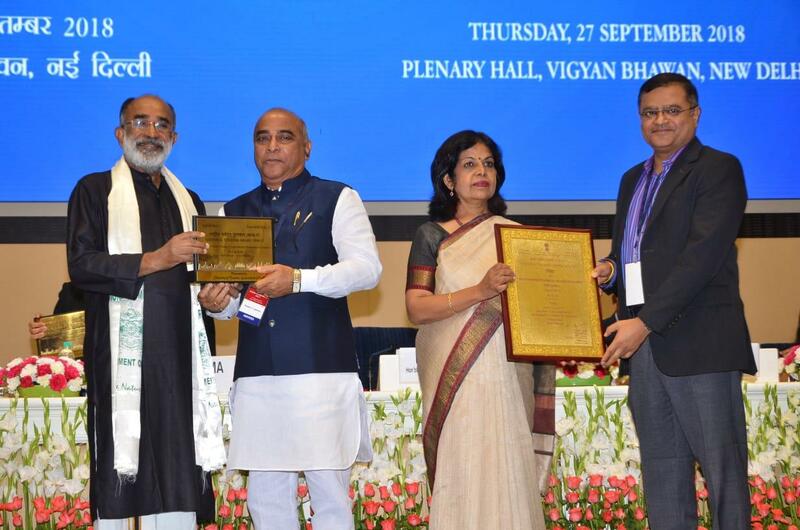 Today’s award was presented at a glittering ceremony at Vigyan Bhavan in New Delhi coinciding with the occasion of World Tourism Day, 27th September 2018. The NTA awards have been instituted since 1990 and presented to State governments/UTs and several other tourism bodies in recognition of their performance in the respective fields of travel, tourism and hospitality encouraging healthy competition with an aim to promote tourism. Goa’s selection for the award comes as a result of a well documented submission on the State’s achievements in tourism over the last six years which has achieved fruitful results in various sectors be it infrastructure development, commissioning of tourism projects, launching of tourism products and services, initiatives taken on safety and security, cleanliness and hygiene, policies, marketing and promotion, events and activities etc.